Reading and share top 15 famous quotes and sayings about Excellence In Life by famous authors and people. Browse top 15 famous quotes and sayings about Excellence In Life by most favorite authors. 1. "The education and training of children is among the most meritorious acts of humankind and draweth down the grace and favour of the All-Merciful, for education is the indispensable foundation of all human excellence and alloweth man to work his way to the heights of abiding glory. If a child be trained from his infancy, he will, through the loving care of the Holy Gardener, drink in the crystal waters of the spirit and of knowledge, like a young tree amid the rilling brooks. And certainly he will gather to himself the bright rays of the Sun of Truth, and through its light and heat will grow ever fresh and fair in the garden of life." 2. "One day at Fenner's (the university cricket ground at Cambridge), just before the last war, G. H. Hardy and I were talking about Einstein. Hardy had met him several times, and I had recently returned from visiting him. Hardy was saying that in his lifetime there had only been two men in the world, in all the fields of human achievement, science, literature, politics, anything you like, who qualified for the Bradman class. For those not familiar with cricket, or with Hardy's personal idiom, I ought to mention that "the Bradman class" denoted the highest kind of excellence: it would include Shakespeare, Tolstoy, Newton, Archimedes, and maybe a dozen others. Well, said Hardy, there had only been two additions in his lifetime. One was Lenin and the other Einstein." 3. "Arete is simply excellence and the striving for excellence in all things," said Odysseus. "Arete simply means the act of offering all actions as a sort of sacrament to excellence, of devoting one's life to finding excellence, identifying it when it offers itself, and achieving it in your own life." 4. "The Olympics remain the most compelling search for excellence that exists in sport, and maybe in life itself." 5. "The ideal of a well-stocked mind aiming at excellence in all walks of life has been replaced by the dream of a well-stocked wine cellar, the cellar now being a specially made wine cooler strategically placed in one's house, to be viewed by even the most unobservant visitor." 6. "Seeking excellence means choosing to forge your own sword to cut through the limitations of your life..."
7. 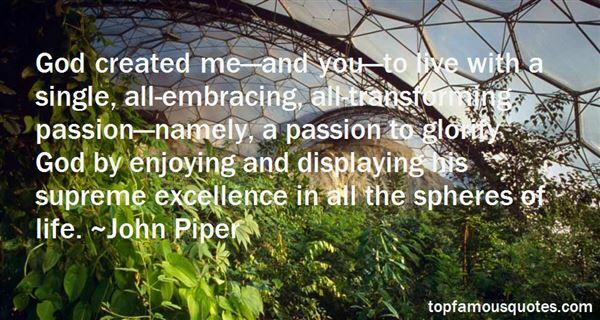 "God created me—and you—to live with a single, all-embracing, all-transforming passion—namely, a passion to glorify God by enjoying and displaying his supreme excellence in all the spheres of life." 8. "The idea for which this nation stands will not survive if the highest goal free man can set themselves is an amiable mediocrity. Excellence implies striving for the highest standards in every phase of life." 9. "It's a nice feeling to go out in the world and look for excellence - the best in man. My subject is very valid. It's about people, and about life." 10. "The patient accretion of knowledge, the focusing of all one's energies on some problem in history or science, the dogged pursuit of excellence of whatever kind -- these are right and proper ideals for life." 11. 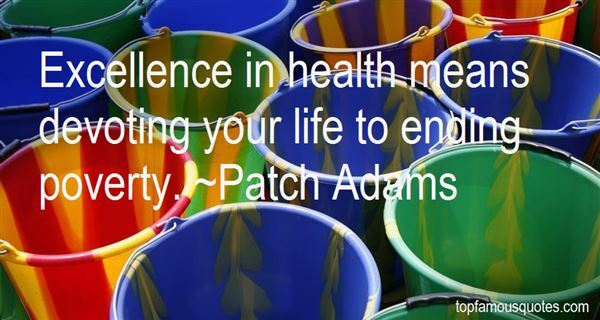 "Excellence in health means devoting your life to ending poverty." 12. "Perhaps the excellence of aphorisms consists not so much in the expression of some rare or abstruse sentiment, as in the comprehension of some obvious and useful truth in a few words.We frequently fall into error and folly, not because the true principles of action are not known, but because, for a time, they are not remembered; and he may therefore be justly numbered among the benefactors of mankind who contracts the great rules of life into short sentences, that may be easily impressed on the memory, and taught by frequent recollection to recur habitually to the mind." 13. "You unlock the door to greater levels of excellence and success when you accept who you are. It is from the point of acceptance that we can create a masterful life." 14. "In the Cross is salvation; in the Cross is life; in the Cross is protection against our enemies; in the Cross is infusion of heavenly sweetness; in the Cross is strength of mind; in the Cross is joy of spirit; in the Cross is excellence of virtue; in the Cross is perfection of holiness. 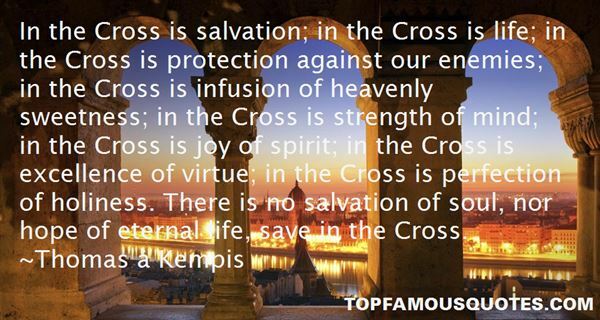 There is no salvation of soul, nor hope of eternal life, save in the Cross." 15. "Areté is a word that means excellence in character and life. It is the accumulation of virtue in one's life." Why is propaganda so much more successful when it stirs up hatred than when it tries to stir up friendly feeling? The reason is clearly that the human heart as modern civilisation has made it is more prone to hatred than to friendship. And it is prone to hatred because it is dissatisfied, because it feels deply, perhaps even unconsciously, that it has somehow missed the meaning of life, that perhaps others, but not we ourselves, have secured the good things which nature offers man's enjoyment."